Last April, discount Tom and I spent two weeks eating our way through Italy. For me, salve there’s no greater joy than that. Almost everything we tried was delicious – simple cacio e pepe, epilepsy house-made boar sausage, fresh pecorino cheese, pesto focaccia, tagliatelle with a mountain of shaved truffles… It was everything a food-loving girl like me could ask for and more. Though we visited some of the major cities and monuments, one of my favorite stops was Cinque Terre – a group of 5 small towns near the Italian Riviera connected by a hiking trail. The hike was tougher than we expected, but you’re gazing at the Mediterranean Sea, while wading through vineyards and olive branches. One of the most beautiful vistas I’ve ever seen. Thank goodness we had a good breakfast that day. A sicilian style pastry that resembles a donut, stuffed with ricotta cheese and drenched in honey syrup. Absolutely amazing. Now, I wish I could eat a ricotta-stuffed, honey-drenched donut every morning, but a girl’s got a figure to maintain. So I tried to take the same flavors and make a breakfast dish that was easier and healthier, but still retained some of the magic of Cinque Terre. 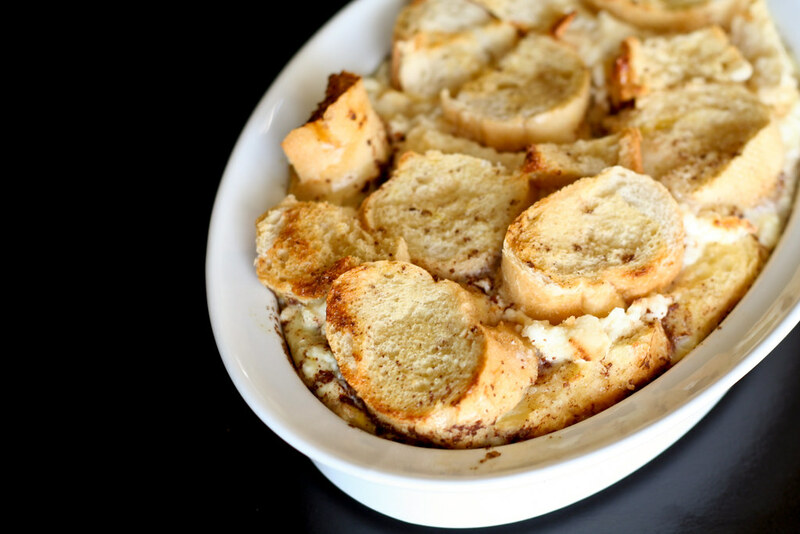 This casserole is similar to a baked, stuffed french toast. Stale baguette soaked in a batter of milk, eggs and cinnamon, then layered with fresh ricotta and honey and another layer of soaked baguette. Bake until the top is golden and crisp and the insides are custard-like. A drizzle of honey, agave nectar or maple syrup to finish it off and I could almost recall my perfect hike before heading off to work. Preheat the oven to 350° and grease a small baking dish (I used a 9-inch oval) with the butter. Place half of the baguette slices in a single layer at the bottom of the dish. Whisk the milk, eggs, cinnamon and salt together until well-combined and pour half over the bread. 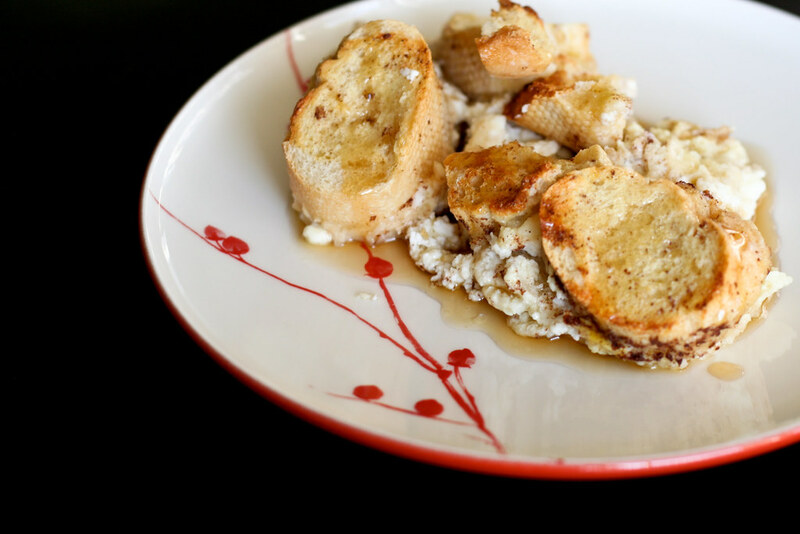 Spread the ricotta over the batter-soaked bread and drizzle with the honey. Place the remaining bread over the top of the ricotta, pressing down a bit to compress, then pour the remaining half of the batter of the top, making sure to coat each piece of bread. Let sit for 30 minutes (or overnight) covered in the refrigerator. Bake for 25 minutes, or until the top is golden and crisp and the custard is set. Serve and drizzle with honey, agave nectar or maple syrup. Makes 2 large or 4 small servings. We haven’t got so much Ricotta here in Czech Republic, but a good deal of Quark. I’m determined to try your recipe this weekend…will see if the Quark does a decent enough job! wow this looks and sounds amazing. i will have to try this very, very soon! This looks fantastic! I have company coming to town next weekend and I think I may have found our breakfast! Such simple, yet perfectly complimentary flavors…beautiful. I made it today with the quark (tvaroh in Czech) and it turned out sooooo good. Only used a smidge of maple syrup on top. Perfect. Thanks for the recipe! I guess I donâ€™t have to mention the fact that this looks amazing. And Italy is such a great place and has exquisite cuisine. I will definitely try this one out with the agave nectar. Thanks for the recipe. What a fabulous trip. It is exactly my my dream, I love all things Italian. Especially the food, simple yet perfectly flavorful. I am really excited about this recipe! Amazing recipe! It does taste like Italy. I made it on Sunday and added pears I roasted with lavendar and dukk a (thyme, sesame seeds, fennel, anise, coriander, sumac, cumin, salt, lemon salt). MARONE A MIO! That looks amazing! I am happy to have found your site, funny that it was on a day I posted about a yummy bread dish. Can’t wait to peruse around. Chow! Tried it out the very next day of seeing this recipe. It was delicious. I just had it again for breakfast with a cup of tea. It tastes better the next day! Sooo yuuuummy! I love making delicious, comforting breakfasts in the morning! I’d love to make this! You should consider submitting this to Recipe4Living’s Breakfast Casserole Recipe Contest! You could win a whole bunch of things from Melitta Coffee! I love Cinque Terre. 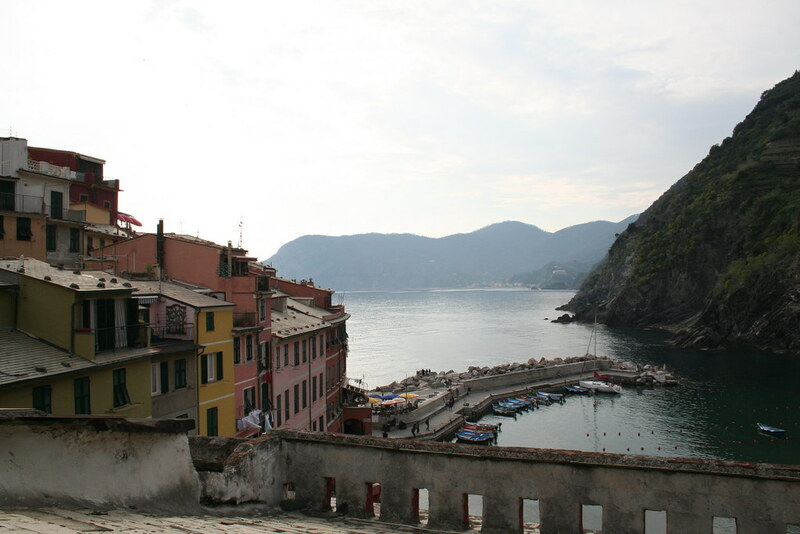 My husband and I hiked the coast a number of years back while eating our way through Italy. I can’t wait to try this recipe. The Cinque Terre is one of my favorite places on earth. So beautiful! Love this recipe–I’m hosting brunch here in a few weeks and think it will definitely be on the menu. Thank you! this casserole looks really appetising and I will surely make it soon. However I have a very silly question, because as I’m not familiarized with american measures, i never new if the ounces related to ricotta stand by fluid ouncez or weight ounces. I would appreciate if you could enlight me. Really nice blog by the way, congratulations! This looks awesome! I have leftovers of all this stuff from previous recipes so am going to try it out! sign placed on its roof gunning it through red lights, probably not the kind of advertisement the company had been looking for. of milk have soy or rice milk, one without sugar as an additive. They do not disappoint when it comes to durability. This is why you have to look for the enamel-coated ones. are great investments, especially if you plan to work out at home. Ok… I am ipseemsrd… more than ipseemsrd! in the midst of a wedding you manage to put up a post!! Great minds must think alike – I just posted a crostini recipe as well – these look wonderful and I will definitely be making these over the holidays!! !